EAST RUTHERFORD, N.J. Carrying signs to express their gratitude and their choice of love over violence in the wake of the Sandy Hook Elementary School massacre, approximately 400 residents of Newtown, Conn., attended the New York Giants-Philadelphia Eagles game Sunday. The residents, including about 200 students from the school system, formed a gantlet to welcome players from both teams before the game. They then held hands and ringed the field as the national anthem was played at MetLife Stadium. 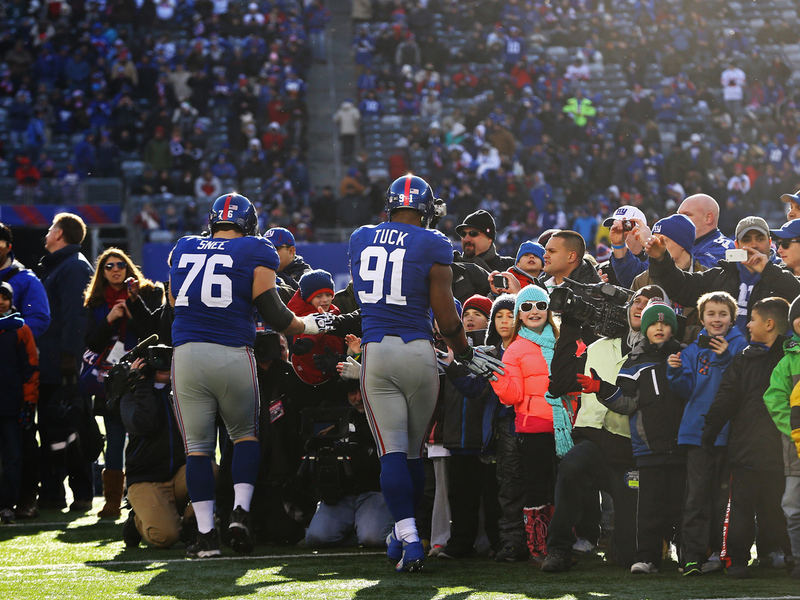 Players on both teams exchanged high-fives with the residents, who the Giants said included the family of Jack Pinto, the 6-year-old fan of the Giants who was buried in a No. 80 jersey of Victor Cruz, his favorite player. NFL Commissioner Roger Goodell also greeted the people in a tunnel at the stadium. Giants spokesman Pat Hanlon said there were a few families in attendance who lost children in the attack earlier this month. The families arrived in nine chartered buses. The team did not allow access to the residents, saying they just wanted to attend the game and enjoy themselves. There were at least a dozen hand-made signs in the stadium, with the most poignant a green-and-white one that said, "Sandy Hook: We Choose Love." Eagles coach Andy Reid and Giants coach Tom Coughlin each walked the gantlet slowly and said hello to as many people as they could. The Newtown massacre happened Dec. 14 when gunman Adam Lanza forced his way into the elementary school and gunned down 20 children and six adults in one of the deadliest school shootings in U.S. history. .